Main Stories: The US has issued an emergency warning in the midst of a continuing political crisis in Sri Lanka. 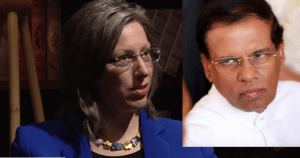 US Ambassador to Sri Lanka Alina Deblits has warned that the impact of the problem will be too soon. He insisted on this issue in the medium given to the media. "President Maithripala Sirisena must act responsibly to solve Sri Lanka's political crisis conditions. It must be resolved in a transparent and democratic manner. The political crisis is the domestic affair of Sri Lanka. We do not want to interfere in that. But if this persists, it will have to face many of the economic impacts. Damages can occur on state enterprises. In this situation, Sri Lanka is confident of maintaining its trust with its allies in the future. So I want to emphasize that a legal state should be the way to form a government. "